April 19 is the deadline for applying to the Minnesota Board of Water and Soil Resources for grants under the One Watershed, One Plan program. The agency has up to $1.5 million available in Clean Water Funds for these grants. This funding is for partnerships of counties, watershed districts, and soil and water conservation districts to use a systematic, science-based approach to watershed management to develop plans that provide the greatest environmental benefits to each watershed. The Clean Water Fund was established by the Legacy Amendment passed in 2008 that dedicates a special sales tax to environmental projects. May 15 is the deadline for proposals to the Legislative-Citizen Commission on Minnesota Resources for grants from the Environment and Natural Resources Trust Fund, which is funded with Minnesota Lottery and investment proceeds. The commission expects that $50 million will be available for projects that start in July 2018. The commission is responsible for making funding recommendations to the Minnesota Legislature. The full Request for Proposals is available on the commission’s website. Since 1991, the fund has provided about $500 million to 1,000 projects around the state. Thanks to many partners and funding sources, Bald Eagle Lake in the northern Twin Cities is meeting state water quality standards for the first time since 1980. Once plagued by algal blooms and murky water, this lake near Hugo is now much healthier for recreation. “This is an example of good science, strong collaboration, and fiscal responsibility resulting in a successful restoration project with an estimated project lifespan of at least 30 years,” said Bryan Bear, Hugo city administrator. Partners in the lake restoration included the City of Hugo, lakeshore property owners, and a local golf course. Following the implementation of the project, phosphorus and algae decreased by 67% and 69%, respectively, and clarity improved by 63%. Bald Eagle Lake is meeting state water quality standards for nutrients, algae, and clarity for the first time since 1980, when data collection began. “Today we have more than 5 feet of water clarity on Bald Eagle Lake. I think it’s closer to 8 or 10 feet this year in August. Three years ago, we were lucky to have 1 foot. I no longer need to worry about my grandsons swimming in a toxic algae bloom!” said Gary Krejcarek last winter. He has lived on or near the lake for 40 years and is president of the Bald Eagle Area Association. This project used a three-pronged approach to improve water quality in the lake. 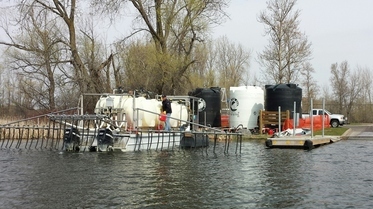 First, the lake was treated with aluminum sulfate, or “alum” (photo above). Alum is a non-toxic material that attaches itself to phosphorus. Once alum and phosphorus are combined, phosphorus is no longer available to stimulate algae growth. This was Minnesota’s largest full lake alum treatment. Second, the local Oneka Ridge Golf Course installed a system that captures stormwater and reuses it for watering the golf course. This reduces the amount of stormwater flowing to the lake and reduces the use of groundwater for irrigation. Finally, 10 residential rain gardens were installed and 6 shoreline areas restored. They capture stormwater and reduce runoff that carries phosphorous into the lake. The project earned the Rice Creek Watershed District a special award in 2016 from the Minnesota Association of Watershed Districts. “This is particularly satisfying because the award is heavily based on the measurable results in the lake. The fact that the homeowners are pleased makes it even more gratifying,” said Matt Kocian, the district’s lake and stream specialist. The Rice Creek Watershed District encompasses about 186 square miles of urban and rural lands in Anoka, Hennepin, Ramsey, and Washington Counties with the purpose of conserving and restoring water resources for the beneficial use of current and future generations. The U.S. Environmental Protection Agency (EPA) recently approved restoration studies for Pope County lakes, along with Buffalo, Cannon and Root River watersheds. 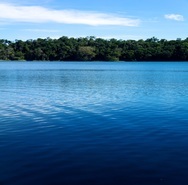 These studies, known as Total Maximum Daily Loads (TMDLs), establish the total amount of pollutants that water bodies can accept and still meet water quality standards. The studies also identify the sources of pollutants and ways to reduce their levels. Eight lakes in Pope County fail to meet the water quality standard for aquatic recreation because of high phosphorus levels that cause algae: Ann, Emily, Gilchrist, Leven, Malmedal, Pelican, Reno and Strandness. The eight lakes are located within a roughly 30-mile radius of Glenwood in west-central Minnesota in the Chippewa River watershed. Sources of phosphorus include direct sources such as wastewater treatment facilities, as well as indirect sources such as stormwater runoff. The study calls for reductions in phosphorus from wastewater treatment facilities in Lowry and Starbuck, and stormwater runoff from construction activities in Pope County, among other sources. The TMDL study and related work have also identified locations where conditions make it difficult to support aquatic insects and fish. This watershed, mostly used for agriculture, covers more than 1,100 square miles in portions of Clay, Becker, Wilkin and Otter Tail counties in western Minnesota. The TMDL is part of a larger Watershed Restoration and Protection Strategies report, which was approved by the MPCA in August 2016. The Cannon River watershed in southeastern Minnesota provides high-quality streams that are valued for trout fishing and other recreation. However, some parts of these streams suffer from bacteria levels that may make the water unsafe for swimming, soil and sediment that cloud the water, phosphorus levels that can cause frequent algal blooms, and nitrate levels that may stress aquatic life like fish. The Cannon River watershed drains 946,440 acres, most of it used for agriculture, and consists of two river systems: the Cannon and the Straight. This watershed provides drinking water for households and industry, habitat for aquatic life, habitat for wildlife, and many recreational opportunities. The Cannon River is designated as a Wild and Scenic River starting downstream of its confluence with the Straight River in Faribault. The watershed has many lakes, along with trout streams that attract many local and Twin Cities residents for fly fishing. For the lakes and streams in the watershed to meet water quality standards, the reductions in pollutants need to come from both point sources, such as wastewater from a city, and nonpoint sources such as sediment that washes from the landscape during storms. The TMDL report outlines strategies to reduce pollutants, such as agricultural practices to reduce runoff and erosion, manure runoff controls, sewer system upgrades, limits on wastewater discharges, and urban stormwater controls. The TMDL is part of a larger Watershed Restoration and Protection Strategies report, which was approved by the MPCA in October 2016. 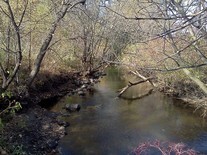 The Root River watershed in southeastern Minnesota provides high quality streams for trout fishing and other recreation. However, some parts of streams suffer from bacteria levels that may make the water unsafe for swimming, soil and sediment that cloud the water, and nitrate levels that may stress aquatic life like fish. At 1,670 square miles, the Root is one of the largest watersheds in Minnesota, and touches six counties. The TMDL study identifies pollutants in the Root River and tributaries, determines the reductions needed, and recommends actions to take like planting cover crops and reducing runoff. The TMDL study is part of a larger Watershed Restoration and Protection Strategies (WRAPS) report, which was approved by the MPCA in November 2016. 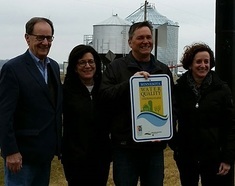 More than 200,000 acres of Minnesota farmland are now enrolled in the Minnesota Agricultural Water Quality Certification Program. The program recently marked the milestone at Dave Lochen’s Shore Acres Farm near Kimball in Stearns County. Shore Acres Farm is a beef cattle and diversified crop operation growing seed and sweet corn, soybeans, and wheat. The Minnesota Dept. of Agriculture (MDA) certification is a voluntary program for farmers and landowners that protects the state’s water resources. Since the program’s inception under Gov. Mark Dayton in 2014, 365 farms have been certified across Minnesota. To date, certified farms have added 628 new conservation practices that protect Minnesota’s waters. Those new practices have kept over 12.1 million pounds of sediment out of Minnesota rivers while saving nearly 17.4 million pounds of soil and 7,414 pounds of phosphorous on farms each year. Those numbers will increase as more landowners enroll in the program. As part of his certification, Lochen has made changes to fertility, reduced some tillage practices, and added cover crops. Those changes will reduce water runoff and improve soil health. After being certified, each farm is deemed to be in compliance with new water quality laws and regulations for 10 years. Certification is also an approved practice that farmers can use to comply with the state buffer law. Photo above: From left are MDA Commissioner Dave Frederickson, Jayne and Dave Lochen, and MDA Assistant Commissioner Susan Stokes. Sustainable Practices for Clean Water is the April theme of Gov. Dayton's “Year of Water Action.” Dayton encourages all Minnesotans to take a role in protecting our state’s most precious resource for future generations. The governor has called on Minnesotans to work together to find solutions to keep Minnesota’s water clean and accessible to everyone. Despite the state’s abundance of lakes, rivers, groundwater and streams, more than 40 percent of Minnesota’s waters are currently listed as impaired or polluted. Researchers found pesticides in 67% of community wells tested throughout Minnesota, but were below levels considered to be health concern, according to a joint study by the Minnesota Departments of Health (MDH) and Agriculture (MDA). The departments conducted the study in 2015 and released the results in October 2016. Researchers studied levels of 135 pesticides and pesticide break-down compounds in 108 community public water system wells in Minnesota. The study was designed as an exploratory study and wells selected were considered to be at higher risk of pesticide contamination. This means results are not necessarily representative of the larger population of community wells or regions. Pesticide levels were detected in 72 wells (67% of those sampled), though below levels of health concern. These findings are based on the MDH or EPA health reference values or standards. To account for multiple chemicals potentially present in the same wells, MDH conducted a cumulative assessment of the potential health risk from combined exposure to the chemicals detected in the samples. That cumulative assessment found that the concentrations did not pose a health risk even when combining chemicals that have common health effects over a common duration of exposure. The study found 19 pesticides and pesticide break-down compounds (degradates) out of 135 analyzed in the samples. A degradate of metolachlor was the most frequently detected compound and was found in 63% of the wells sampled. Metolachlor is primarily used to control grasses and broadleaf weeds in corn in Minnesota. A second degradate of metolachlor was detected in 33% of sampled wells. Other pesticides or pesticide degradates in more than 10 samples include two degradates of the herbicide alachlor, used in corn and soybean production, and one degradate of the herbicide acetochlor, also used in corn production. Most wells (75 percent) had three or fewer pesticide or pesticide degradate detections. Neonicotinoid insecticides were not detected in any of the samples collected. The study recommends future monitoring of community wells for pesticides to evaluate the occurrence of pesticides and pesticide degradates over time. In addition, future studies should expand to include a random selection of high risk and low risk public wells across the state and public drinking water systems that rely on water from lakes or rivers. This will be the 16th event since the network, which focuses on the Minnesota River Basin, started in 2009. Information about previous meetings is located on the watershed network web page. The Pizza Ranch lunch buffet is $10.38. Did you notice the new logo below? The MPCA has a new look. As part of the ongoing rebranding effort for the State of Minnesota, the MPCA is implementing a new logo that is shared with all state agencies. The new logo is a fresh look for state agencies that identifies Minnesota state government as one enterprise working on behalf of all Minnesotans.